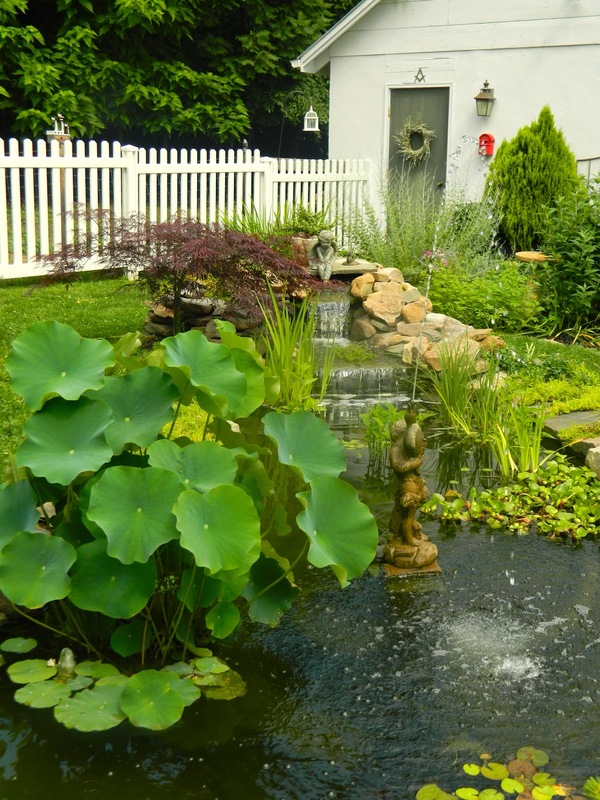 A garden brings pleasure in so many ways. 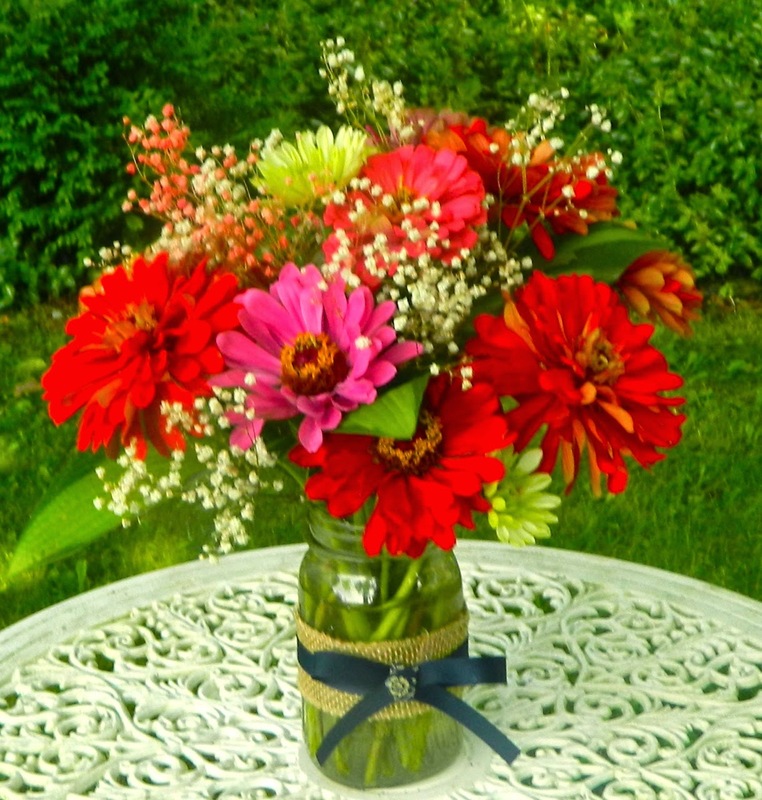 One way is to share it with visiting friends; another is to bring beautiful cut flowers indoors. 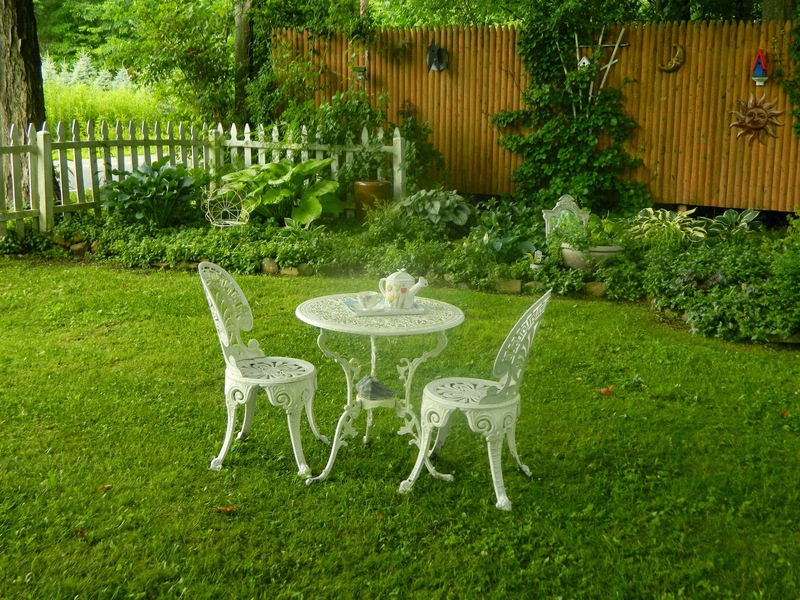 I enjoyed both pleasures recently when some dear fellow gardeners came to my home for high tea. 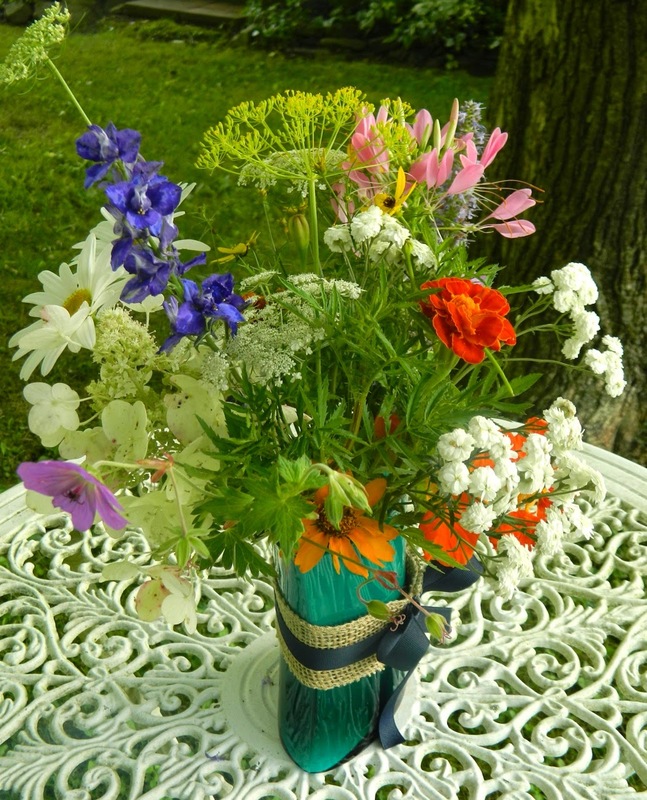 Prior to their arrival, I picked cottage garden flowers to decorate the dining room. 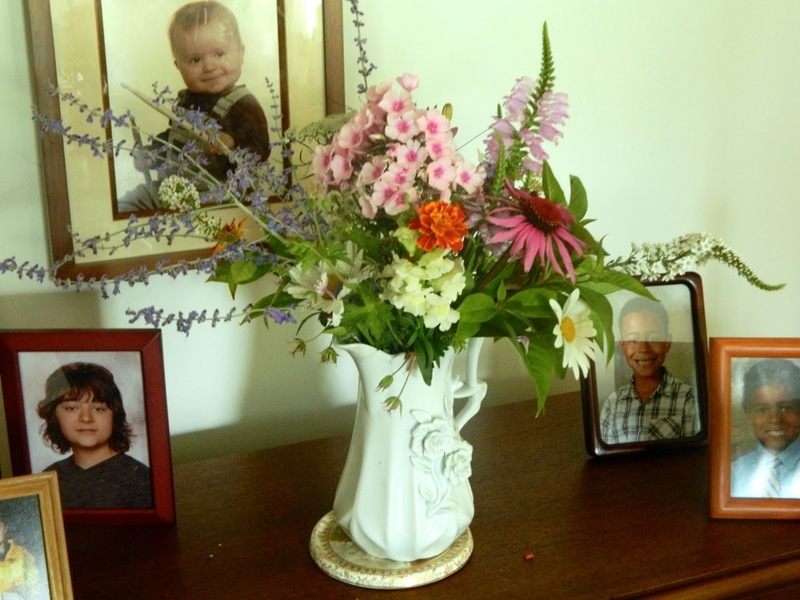 My July garden peaked late this year and my arrangements showed a large variety of blooms. Tea time was fun. 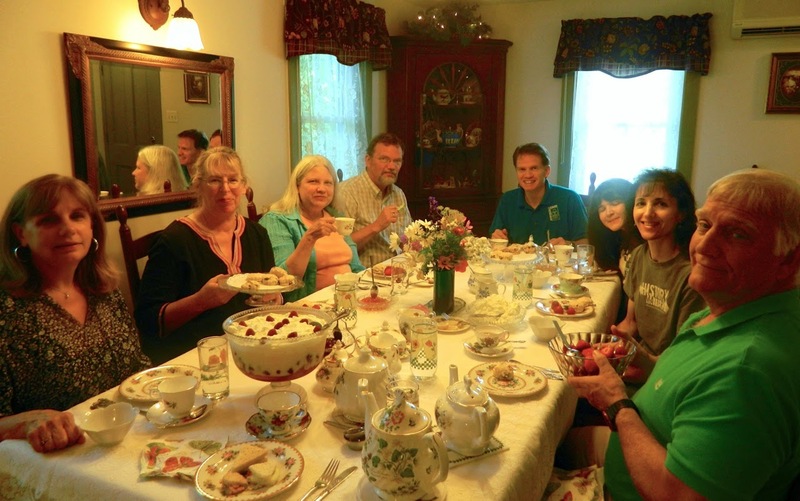 I love to set a table with pretty, English china, tea sandwiches, scones with cream, strawberries, trifle, and tea cakes, on a lace table cloth. Best of all was the conversation with like-minded people, following a tour of the garden of course. Wonderful friends share my English tradition. The white jug was given to me by my friend, Karen, some years ago. I filled it with phlox, cleome, Queen Anne's lace, and purple cone flower. I added spikes of Russian sage, gooseneck loosestrife, and obedient plant. 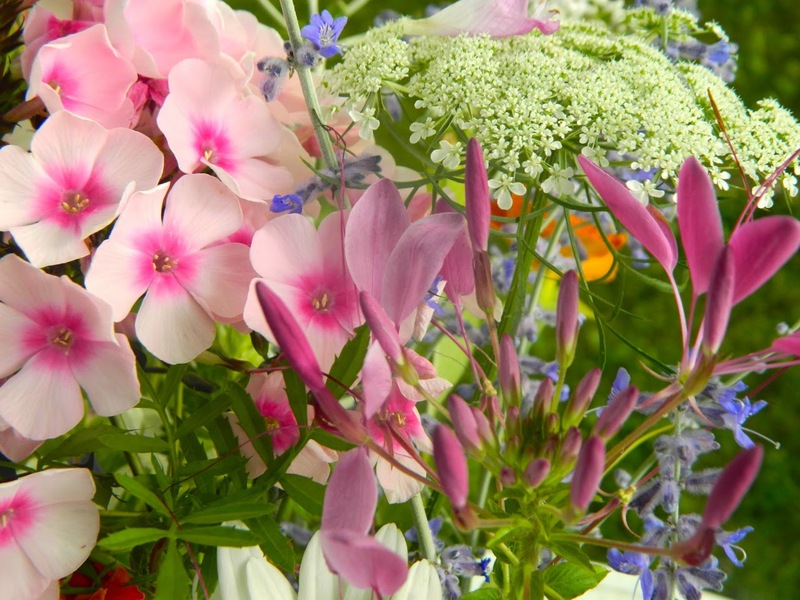 Pink phlox 'Bright Eyes' with cleome and Queen Anne's lace. 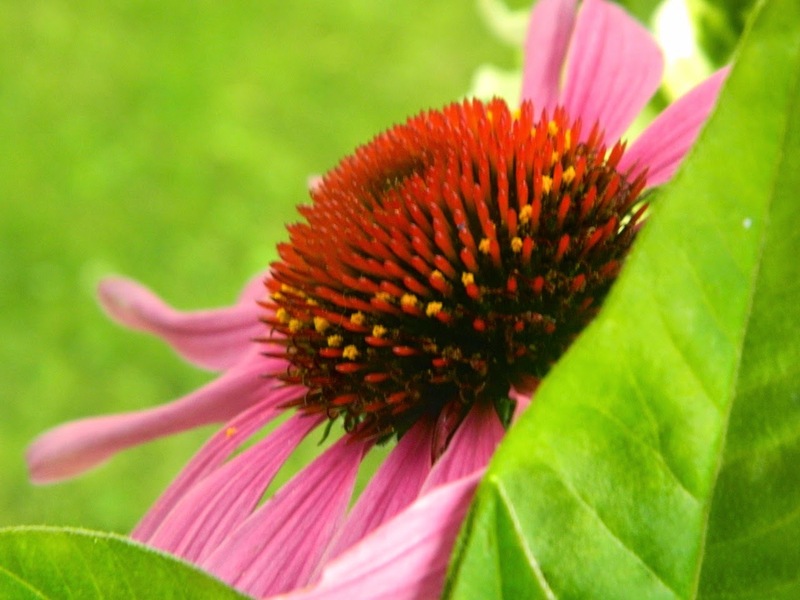 As you may remember, I removed all my echinacea after it was struck with aster yellows. I planted a different variety far from the infected bed, hoping it wont suffer the disease. 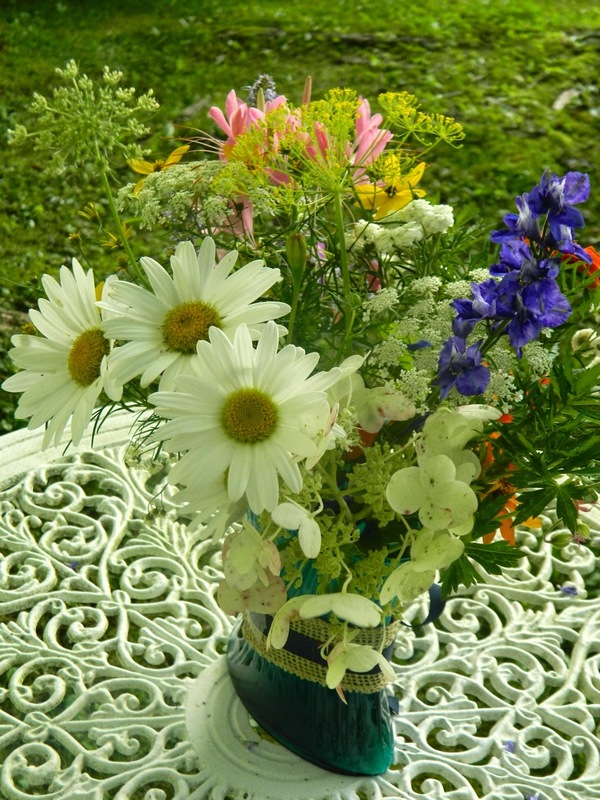 For the table arrangement I used white shasta daisies, tiny yarrow, and Queen Anne's lace, punctuated with colorful nasturtiums, delphinium, and marigolds. 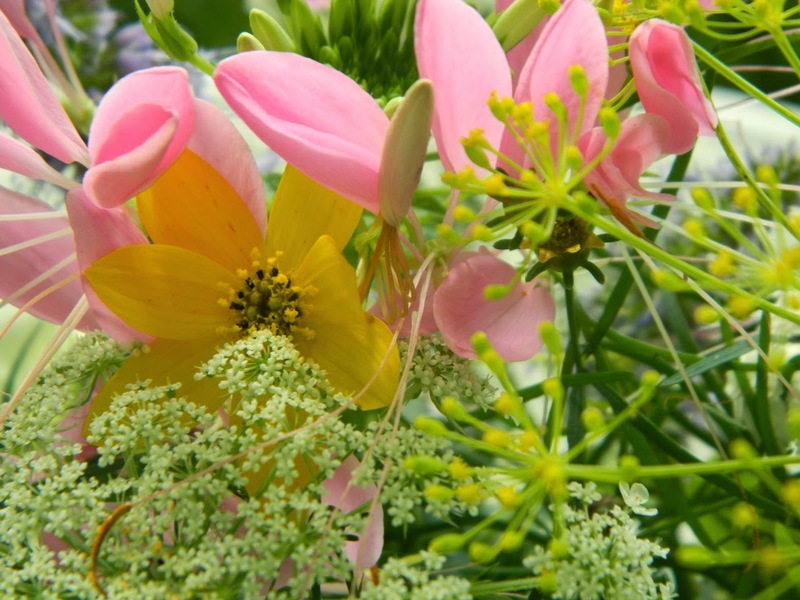 Yellow thread-leaf coreopsis and pink cleome also add color. I added a yellow dill flower. My friend Karen brought flowers from her garden. 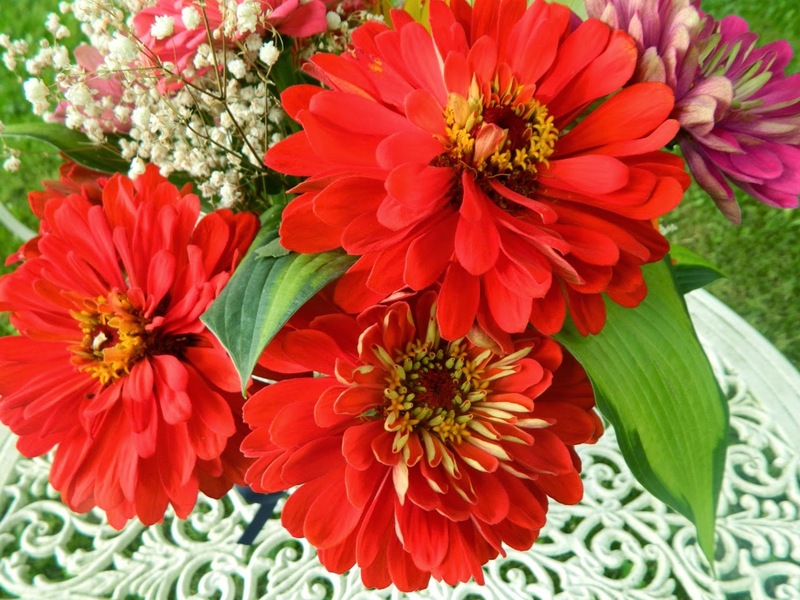 Karen introduced me to the joy of growing zinnias many years ago, but this year my zinnias were very disappointing. Hers, however, left me gasping with envy. 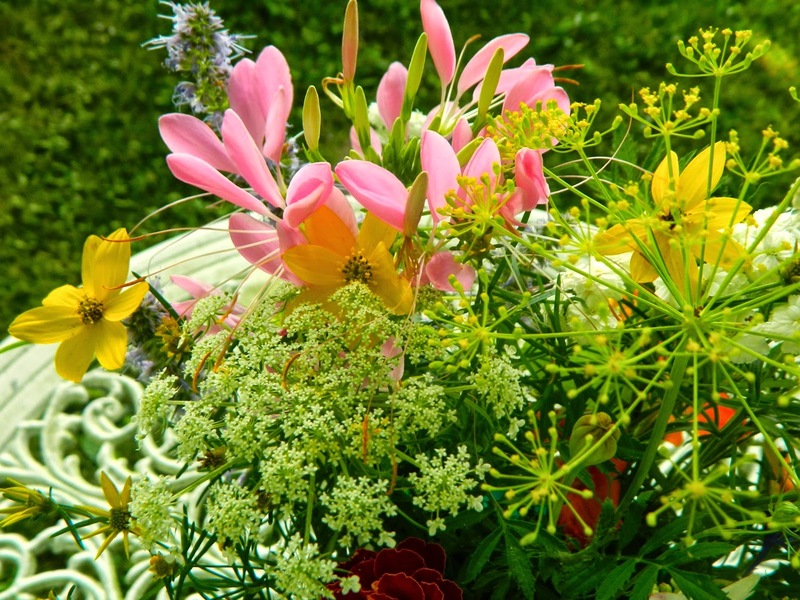 Large and colorful, they made a striking bouquet. Karen uses hosta leaves in her arrangements, to great effect. 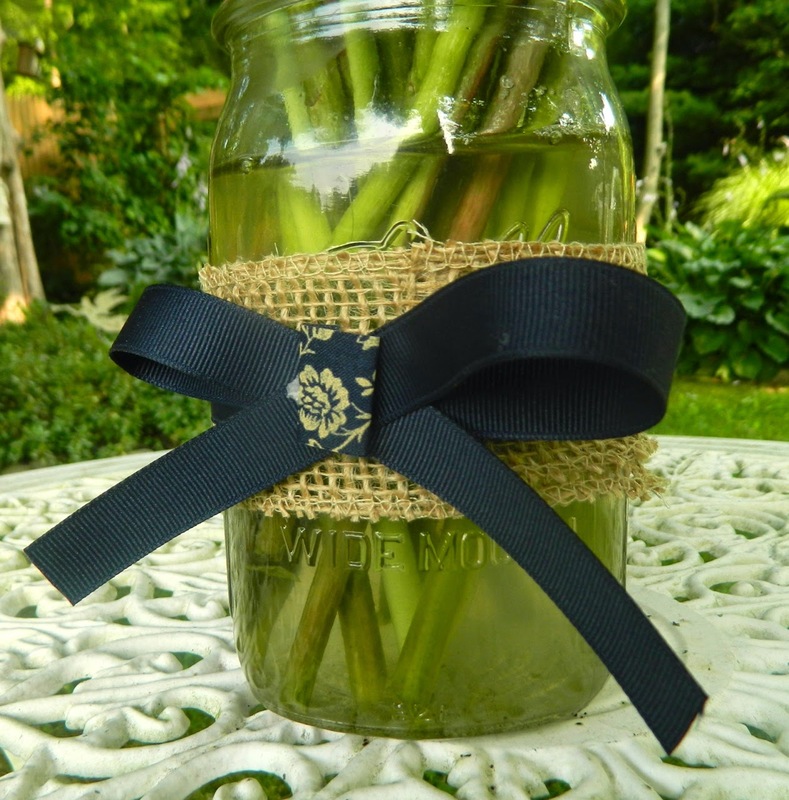 She decorated the mason jar with burlap and ribbon. How lovely is that? Thank you, Karen, and all my wonderful friends, for an enjoyable afternoon of flowers, food, and conversation. 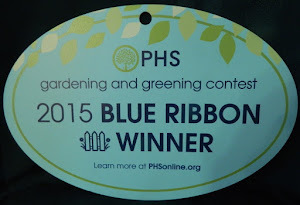 What's New in My July Garden? 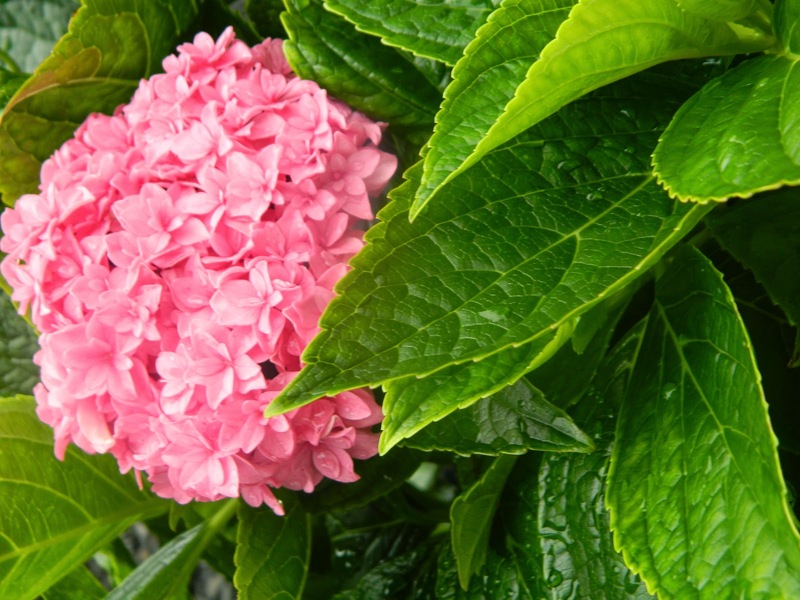 My new mophead hydrangea, Hydrangea macrophylla 'Perfection', was in bloom when I returned from England. H.H. did a great job watering the plants while I was settling my mother's affairs. It was strange going back to my homeland when she wasn't there, but I found the strength to do it. Going back will not be so difficult next time. Unfortunately, H.H. must have watered the weeds, too, because they were prolific. The daily down-pouring of rain this last week hasn't helped, nor the fact that we didn't have time to mulch before I left. At last, now I have finished mulching, just in time for Garden Bloggers' Bloom Day, which Carole at May Dreams Gardens hosts on the 15th of each month. 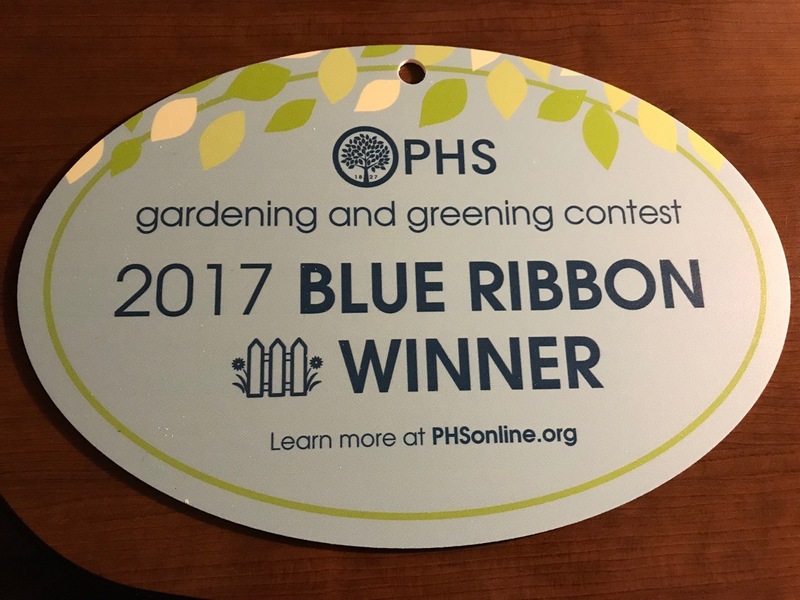 It is difficult to post new pictures each year when you have been blogging for a long time, but fortunately gardens change/evolve and there is always something fresh to see. In the shade garden the false hydrangea vine bloomed for the first time. The flowers are fading now, but you can see the delicate tracing of their white petals. Schizophragma 'Moonlight' False hydrangea vine. Near the swing, the rain knocked down the hostas in the large hosta bed that we call Connie's garden. 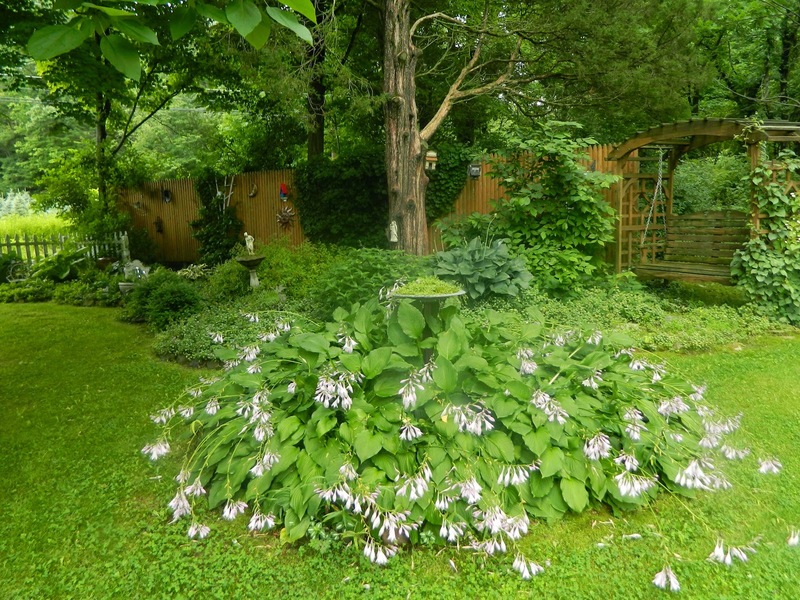 I love this circle of hostas more each year. Before leaving the shade garden through the arbor into the cottage garden, I stop to admire the white hydrangea, 'Pinky Winky', that has doubled in size this year. 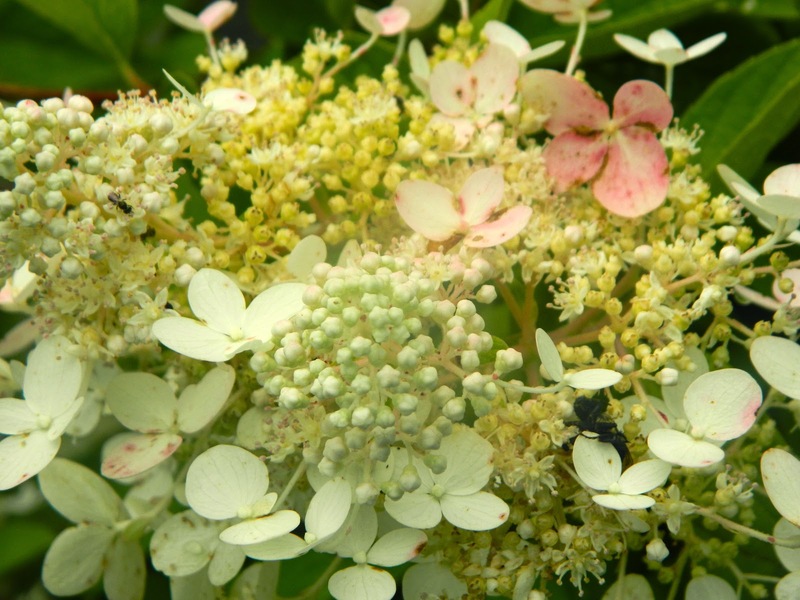 Its white blooms are beginning to turn to pink, and by fall they will be almost red. 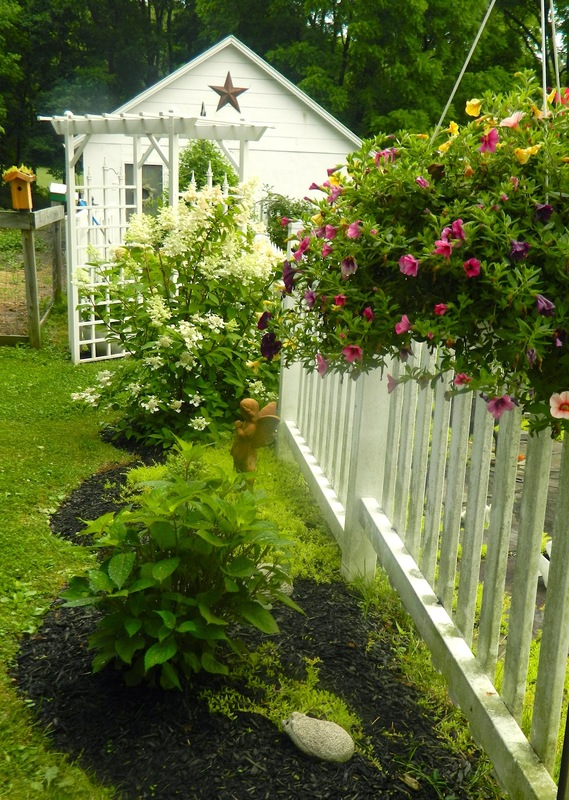 White lacecap hydrangea at the end of the fence. The cottage garden looks different this year because I removed all the echinacea when it was infected with yellow asters disease. 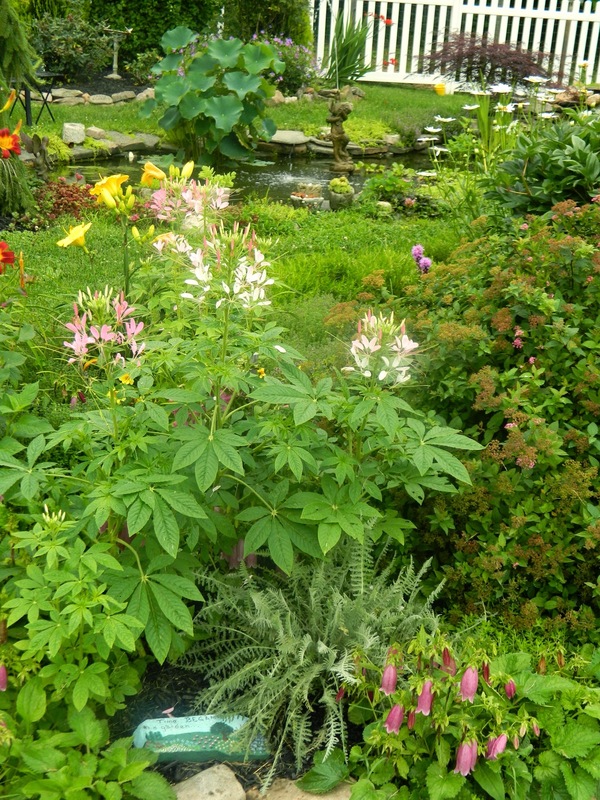 I replaced it with cleome and started some monarda which I hope will fill out over the next several years. 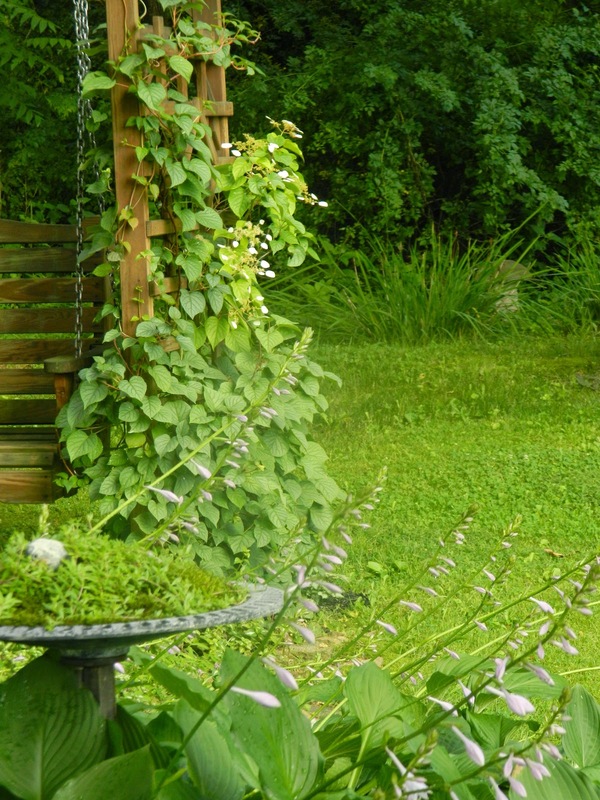 But the garden just doesn't look the same without the purple cone flower. 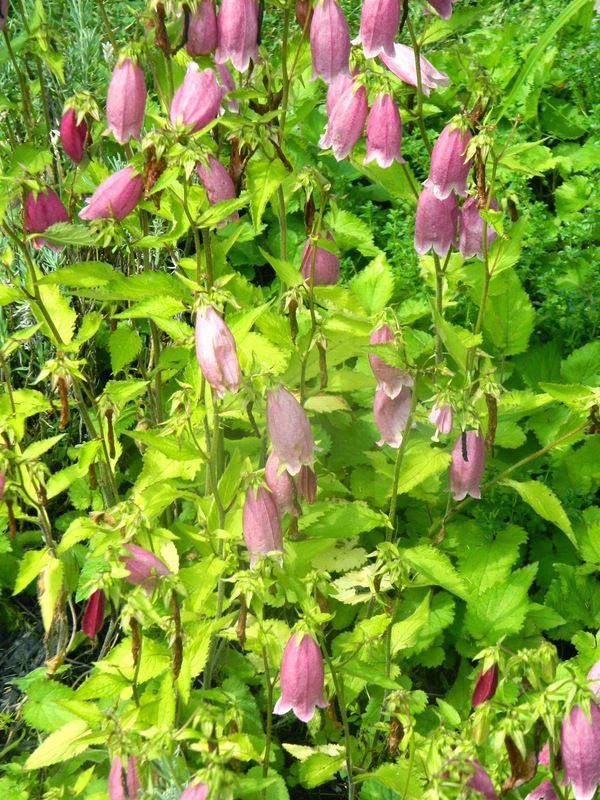 The dusky-pink bells of the campanula are lovely. This plant spreads, but is easy to pull out when it becomes too bold. There is a lot of white in the cottage garden this year, and I'm glad for the splash of red from the crocosmia near the pond. The bright red Crocosmia 'Lucifer,' Montbretia makes a statement. A new addition to the pond is the lotus plant which we bought for its enormous leaves. 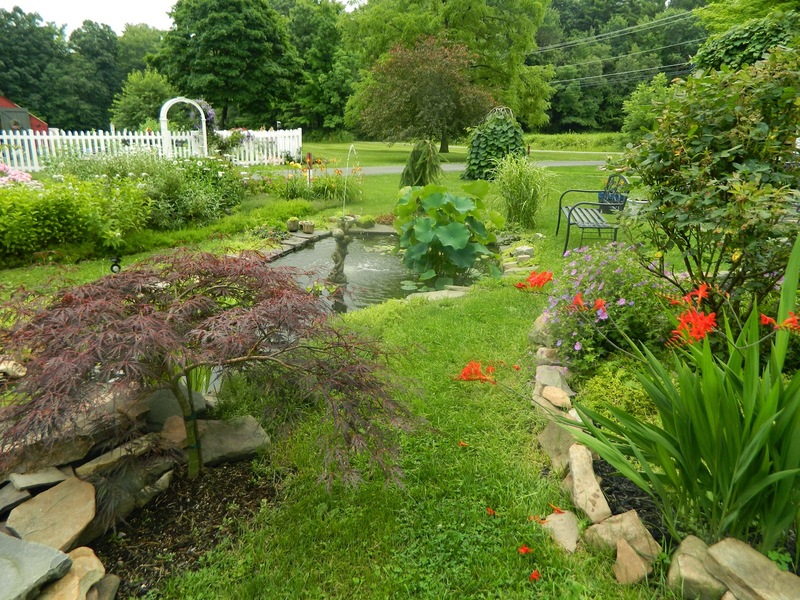 Our pond is in full sun and we look for ways to add shade. The flower is fabulous so I am hoping it will bloom this year. 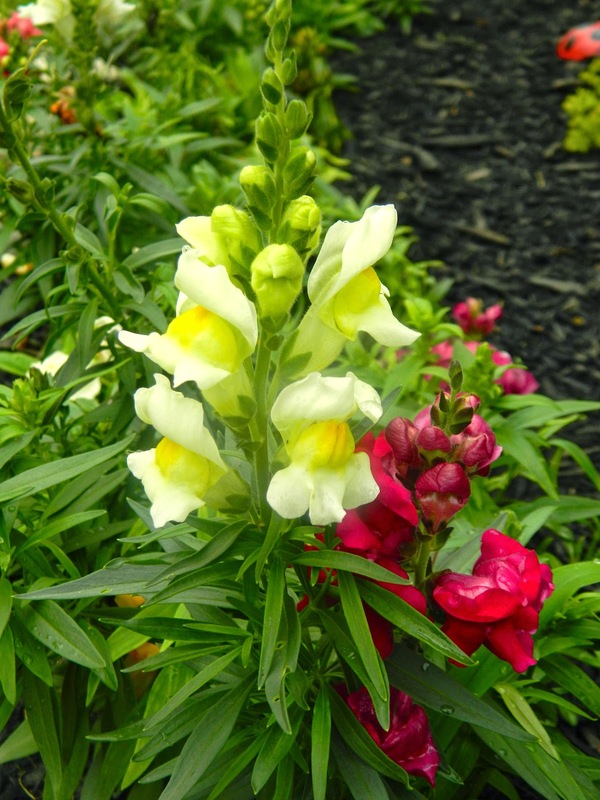 Not many of the annuals I grow from seed were successful this year, but the snapdragons are putting on a fine show in the new addition to the cottage garden. 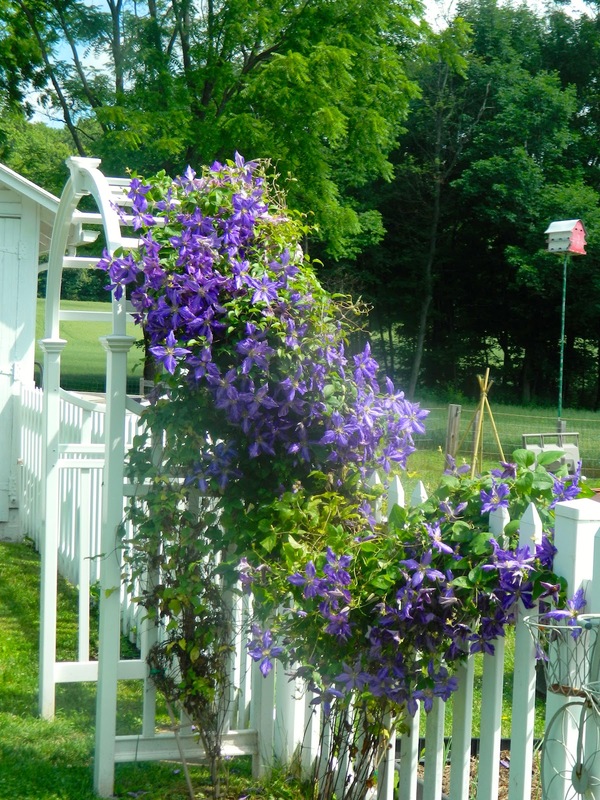 My favorite clematis has climbed over the arbor we installed last year at the entrance to the kitchen garden. The perennial border that we call 'The Obedience Garden' is fuller than ever this year. 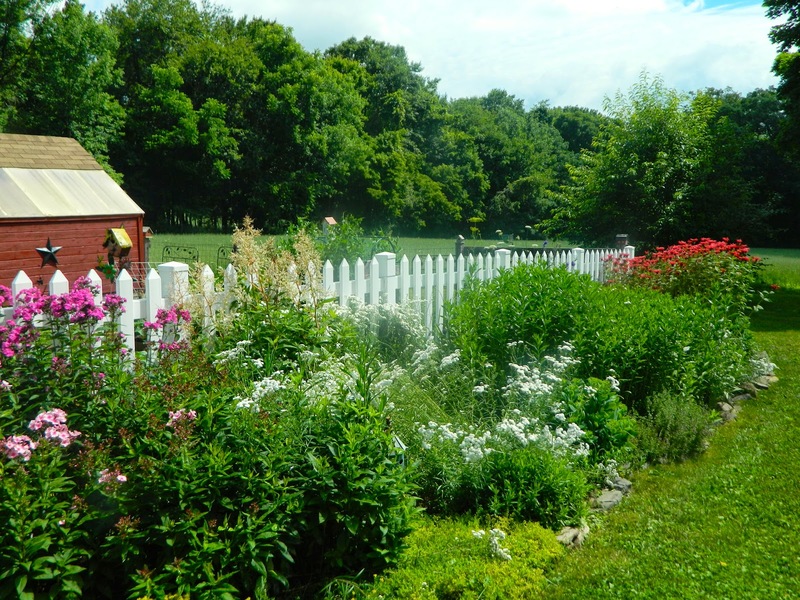 The pink phlox are in bloom at one end and the red monarda at the other. I've had so many disappointments in the kitchen garden this year mainly due to the destructive rabbit who lives under the potting shed. 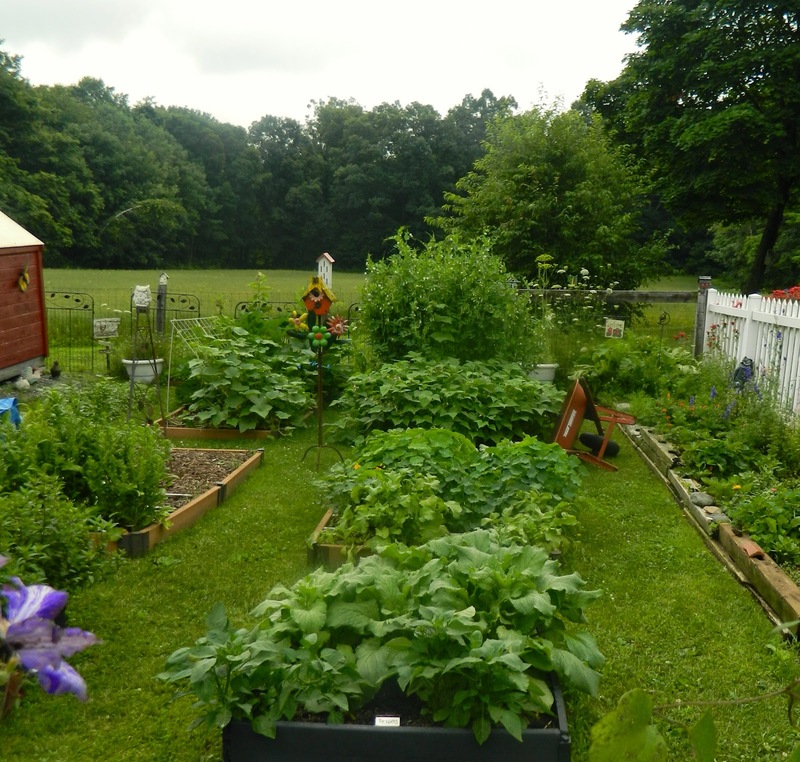 He ate every single red beet and two types of Swiss chard when they first germinated, despite H.H. 's best efforts with deterrent. I was in England at that time. So there will be no pickled beets to enjoy next winter. 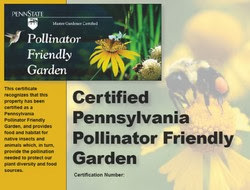 New this year, I planted borage for the blue flowers to attract pollinators. Borago officinalis Borage planted in the nearest raised bed in this picture. Do you see the colorful tin sculpture of a bird house in the picture above. I added this whimsical piece to my garden last year. A bluebird has taken up residence. 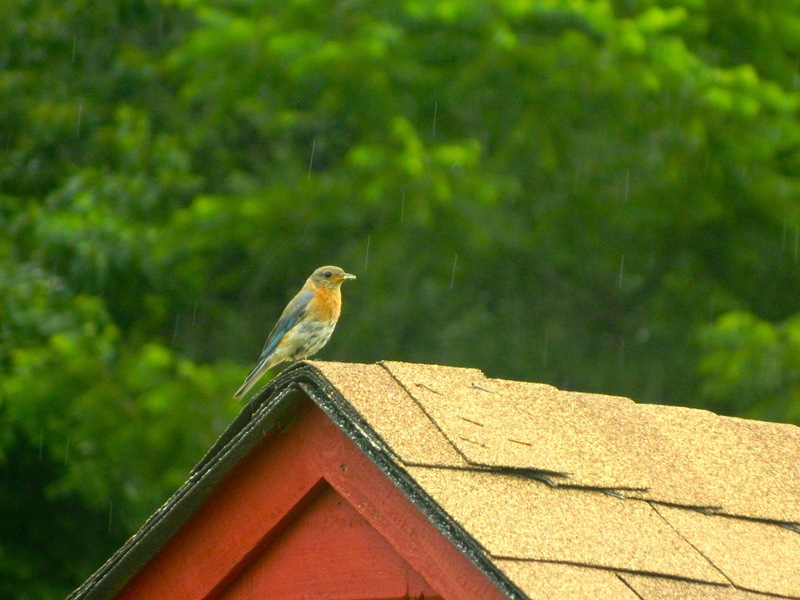 The bluebird waits patiently, on top of the shed, for me to leave the kitchen garden. 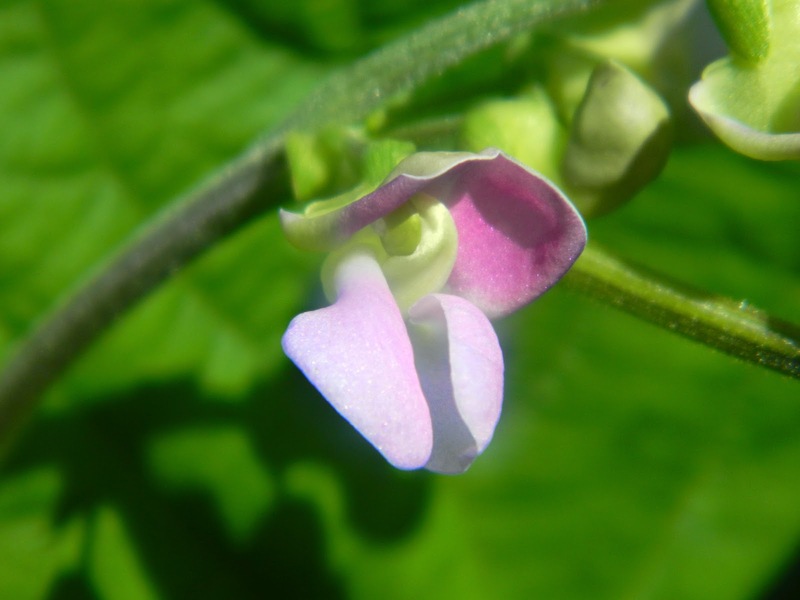 My favorite bloom in the kitchen garden is the blossom on the new (to me) variety of bush bean. 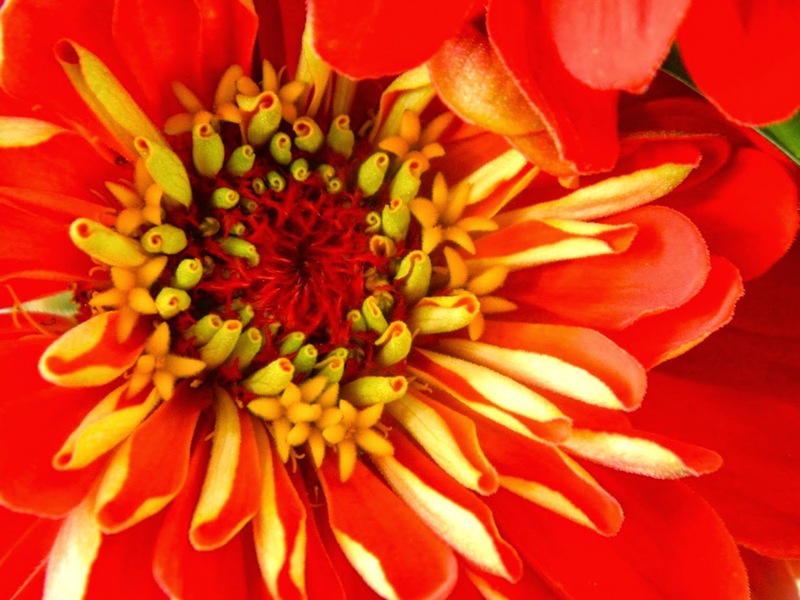 Such delicate colored petals.